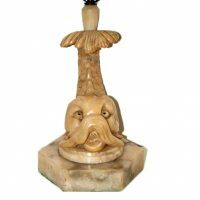 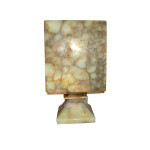 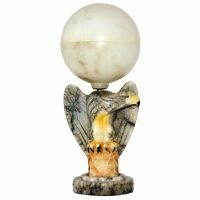 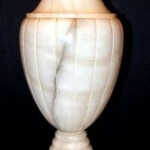 A single circa 1930's Italain carved alabaster table lamp shaped as dolphin. 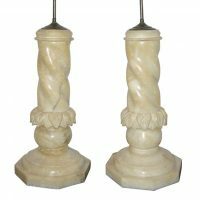 Measurements: Height of body:: 16" Height to shade rest: 26.5"
A Pair of circa 1930's Italian carved alabaster 'fruit bowl' table lamps. 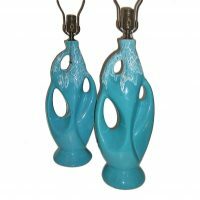 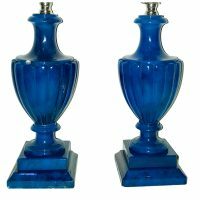 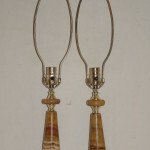 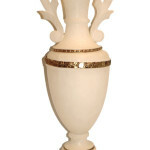 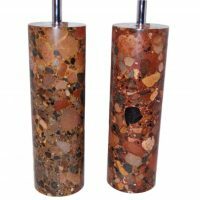 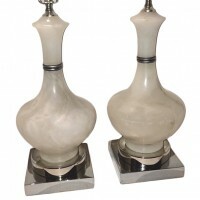 *These can also be modified as decorative objects without the lamp stem. 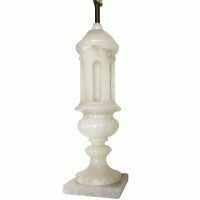 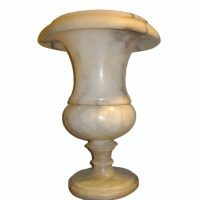 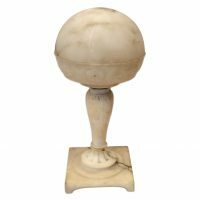 Measurements Height of Body: 18" Diameter: 14.5"
A single circa 1930's Italian carved column shaped alabaster table lamp with original patina. 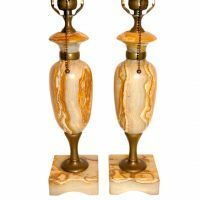 Measurements: Height of body: 18" Diameter: 5"
Pair of 1920's French alabaster table lamps with bronze fittings, neoclassic style. 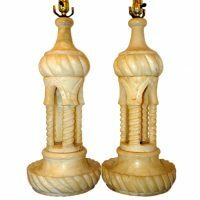 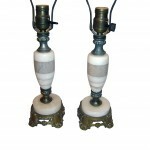 A pair of 1920's Italian carved alabaster table lamps with interior light. 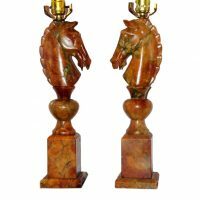 Measurements: Height of body: 12" Diameter: 6"
Pair of Italian circa 1930's carved alabaster table lamps in the form of horses. 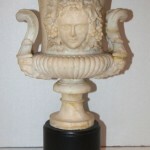 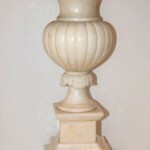 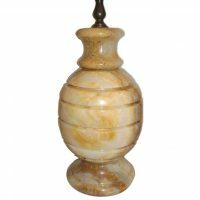 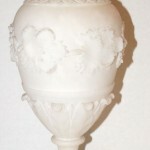 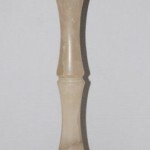 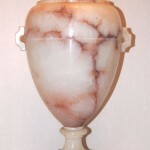 Measurements: Height of body: 16"
A very large, carved alabaster table lamp with brown veining on an ivory background. 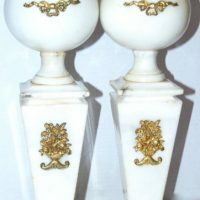 Gilt base. 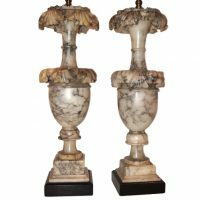 Pair of circa 1920's Italian carved gray alabaster lamps with dark veining and foliage motif on body as well as square pedestal bases. 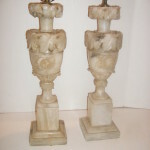 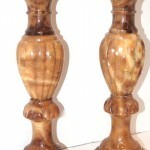 Measurements: Height of body: 22"
Pair of circa 1920's carved alabaster table lamps. 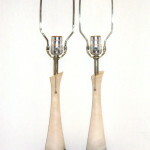 Measurements: Height of body: 22.5" Height to shade rest: 34"
Pair of Italian 1960's porcelain lamps, light blue with white details. 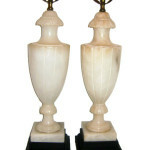 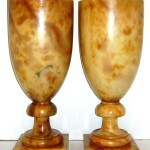 A circa 1940's pair of French alabaster carved table lamps. 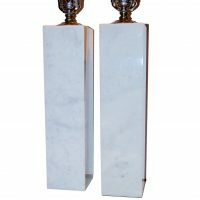 Measurements: Height of body: 14"
A pair of circa 1950's Italian white marble with light gray veining and square columnar shape. 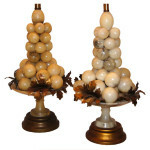 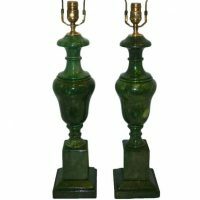 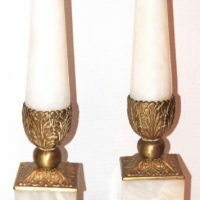 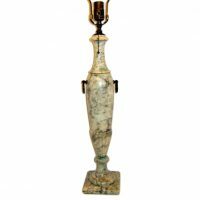 Measurements: Height of body: 16"
Pair of 1920s French Italian alabaster and bronze table lamps with gilt bronze details. 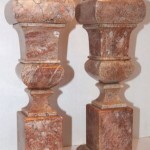 22" height of body 209 East 59th Street. 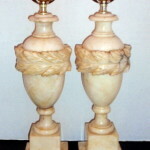 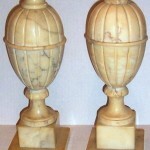 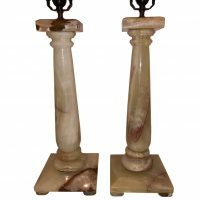 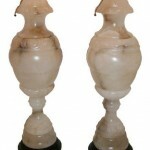 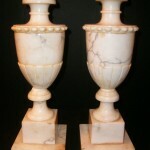 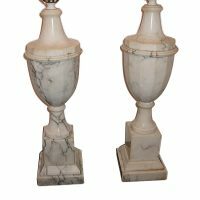 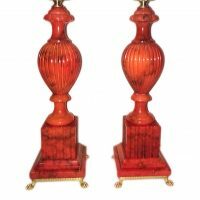 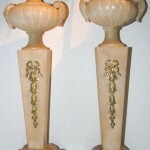 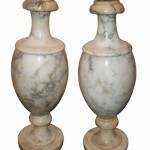 Pair of 1940s Italian pink marble table lamps of neoclassic style. 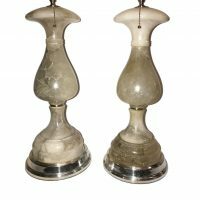 Measurements: Height of body: 19" Height to shade rest: 31"
Pair of circa 1930's Italian carved alabaster lamps with gray veining on the body. 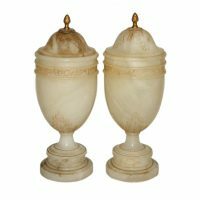 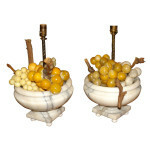 Measurements: Height of body: 15"
A pair of Italian circa 1930's large alabaster lamps shaped as grapes on an alabaster tassa. 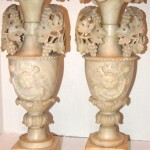 Gilt wood bases, gilt metal grape leaves. 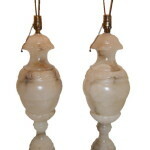 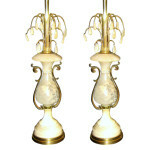 Measurements: Height of body: 22"
A pair of 1940's Italian table lamps with alabaster pendants and bronze details. 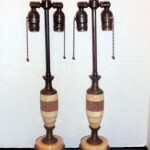 Measurements Height of Body: 20"
Pair of 1950's Italian urn shaped lamps with interior lights. 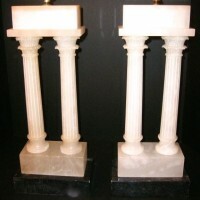 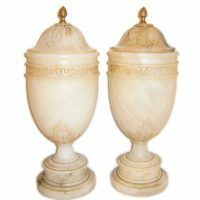 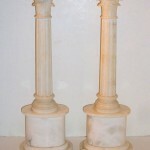 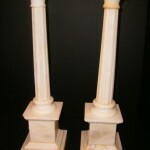 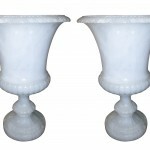 Measurements Total Height: 13.5"
Pair of Circa 1940's French carved alabaster urns with interior lights. 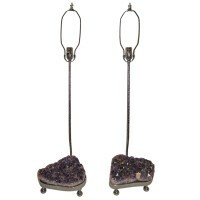 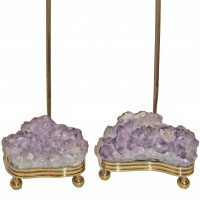 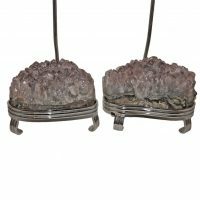 Measurements: Total Height: 14.5"
A pair of circa 1960's silver finish Italian table lamps with amethyst stones. 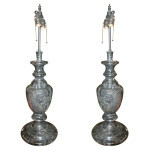 Measurements: Height to shade rest: 36"
Pair of circa 1920's Italian gray, black and white baluster shaped marble table lamps with double light cluster. 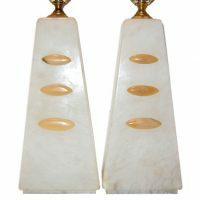 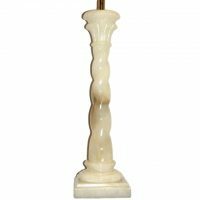 Measurements: Height of Body: 23" Height to Shade Rest: 33"
Pair of large circa 1930's Italian hand-carved alabaster columns mounted as lamps. 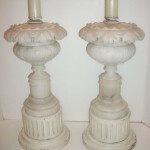 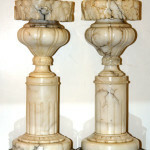 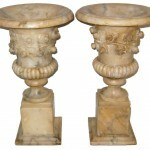 Measurements: Height: 24" Diameter: 12"
Italy, 1920 Pair of circa 1920's Italian carved alabaster multi-column table lamps. 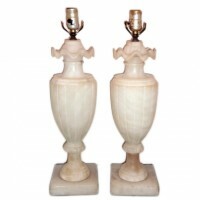 Measurements: Height of body: 22.5" Diameter of base: 9.5"
Pair of 1920's Italian carved alabaster table lamps with pedestal base. 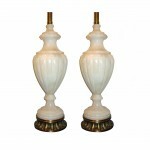 Measurements: Height of body: 20" Height to Shade Rest: 32"
Pair of 1940's Italian marble cylinder-shaped table lamps. 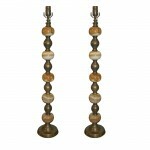 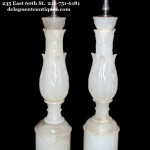 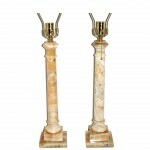 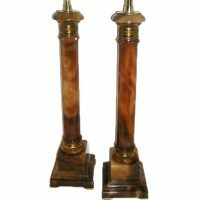 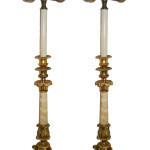 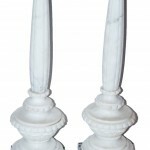 Measurements: Height of Body: 18"
A pair of circa 1940's French Neoclassic style carved onyx column lamps. 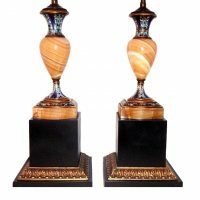 Measurements: Height of body: 19" Height to shade rest: 29" Base: 7"